Clark University alumni working in a range of legal professions returned to campus on Nov. 16 to share their expertise and advice with students eyeing careers in the law. Gavin Bates ’07, J.D., a housing attorney with South Coastal Counties Legal Services, speaks to Clark students during a recent Networked Communities event. 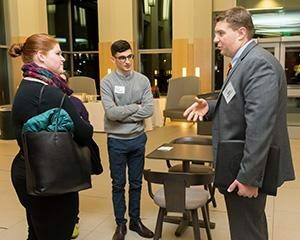 The event was the second for ClarkCONNECT, which matches students with alumni, faculty, parents and outside partners for career mentorship opportunities. 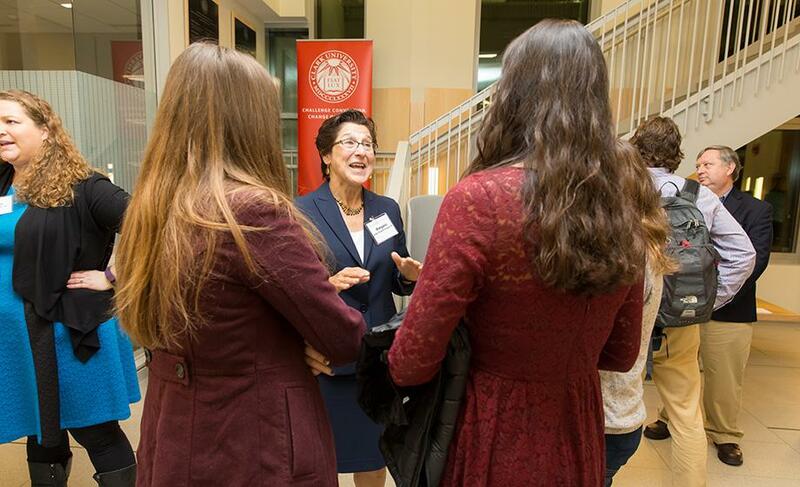 The debut event for Biology and Biosciences was held Nov. 3. Mark Miller, professor of political science and director of the Law and Society Program at Clark, moderated a panel on the “Practice of Law in Government,” with Gavin W. Bates ’07, J.D., a housing attorney with South Coastal Counties Legal Services; Heather Castillo ’03, J.D., attorney and hearing officer, Massachusetts Department of Public Utilities; and Dylan Mawdsley ’06, J.D., assistant general counsel, Massachusetts Department of Mental Health. 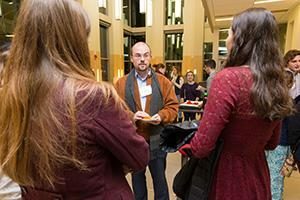 Join fellow alumni, friends, faculty and students at the launch of the Creative Arts ClarkCONNECT on Dec. 1 in the Alumni and Student Engagement Center. A jazz performance will be held at 6 p.m., followed at 6:30 p.m. by “Painting with a Broad Brush: Creative Arts at Clark,” a discussion moderated by Professor Gino DiIorio ’83, M.F.A. The evening will conclude with an informal reception/networking opportunity. Patricia Ewick, professor and chair of the Sociology Department, who also teaches in Clark’s interdisciplinary Law and Society concentration, moderated a “Diversity in Law Practice” panel featuring Richard Fields ’03, J.D., a principal at Tapestry Networks, a Waltham- and London-based legal services firm that works with businesses and institutions; Matthew Holmes ’06, J.D., an attorney with Milton, Laurence & Dixon, a law firm in Worcester; Massachusetts District Court Judge Margaret Guzman ’89, J.D. (pictured above); and Alan Sharaf ’72, Ph.D.’78, J.D., a partner with SKM Title & Closing Services in Brookline and South Easton. The panelists in the “Practice of Law in Government” session talked about the specific challenges and benefits of pursuing a legal career in the public sector. The number of cases for a government worker is typically higher than for someone at a large private firm, and the pay lower, but the hours usually are more manageable and offer better work-life balance, Castillo said. She’s practiced law in both private and public settings. “If you want to work in government, you have to believe in it, otherwise it’s not worth it,” she said. They noted that having compassion for clients and their families, who often come from marginalized populations, is critical to public service. It’s also essential, they said, to effectively summarize complex legal concepts for clients who likely don’t understand how the system functions. Mawdsley said he sometimes finds himself in the role of liaison between doctors, judges and other attorneys, feeling “more like a psychologist than a lawyer” because of the complicated cases he handles. A government lawyer almost certainly gets more court experience than someone working for a large firm, he added, noting he’s faced with eight to 15 cases a week. Bates, who often represents people under threat of losing their homes, said housing lawyers need to be tough as well as empathetic, which is essential when the stakes are high. “Sometimes you have to be willing to be a jerk, because the person you’re representing has a lot to lose,” he said. “I’ve got my lawyer hat, and I’ve got my human being hat. Anyone can learn the law, but you can’t teach compassion. The “Diversity in Law Practice” panelists presented an overview of their paths to law school and careers. Holmes, who graduated from Hamline University School of Law in Minnesota in 2009, entered a job market in the throes of a recession and spent years working on contract in litigation firms in Boston before a posting on Clark’s LinkedIn profile led him to the firm of Milton, Laurence & Dixon. He’s still there. Dylan Mawdsley ’06, J.D., assistant general counsel for the Massachusetts Department of Mental Health, speaks to Clark students. Guzman also attended law school later in life, obtaining a J.D. from Boston University in her early 30s. She grew up outside Worcester in a family of eight children that “became poor overnight” when her father left. Though a talented student, her prospects for attending college were dim. She married, moved to Florida and worked in dead-end jobs. Seven years later, she divorced and moved back north with the goal of attending college and becoming a public defender like the one she watched on the TV show “Hill Street Blues.” She landed at the University of Southern Maine and later transferred to Clark. “That changed the trajectory of my life,” she said. “I loved the education I got here.” After nearly two decades as a public defender and trial lawyer, she was appointed a judge in 2009. Fields attended the University of Chicago Law School and landed at a Boston law firm, but left his job with the goal of becoming a military lawyer, or JAG officer. One thing stood in the way of his required officer training, however: a childhood medical issue that ultimately resulted in an Air Force rejection letter. “Your road diverges, and you go down a path that you don’t expect,” he said. He worked with a legal recruiter who identified a more non-traditional career: working in legal services for Tapestry Networks, where he has become an expert in the governance of large public companies.